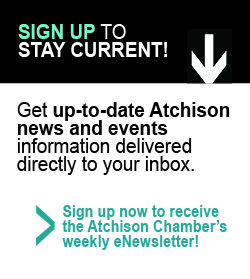 For more than 90 years members of the Atchison Area Chamber of Commerce have gathered to celebrate the past year, look forward to the coming year and honor those who have excelled. The event is one of the highlights of the year for area businesses and organizations. Sponsorship includes table of eight, along with varying amounts of complimentary drinks, gifts, company signage and gift certificates. This marks the 39th year in which members of the Atchison area business community have taken time to honor those in the agricultural community. The event includes a large banquet, activities, showcase booths, contests, prizes and entertainment. Area businesses donate tickets, which are then donated to farm families, either by the Chamber or the donating businesses themselves. A city-wide Spring Clean-up and a smaller Fall Clean-up. Both events encourage residents to recycle, while drawing hundreds of area volunteers to clean up Atchison’s streets, parks and riverfront areas. It is one of the great examples of residents and the business community working together to benefit the city. Popular annual event brings Chamber members together for an enjoyable day of golf, contests and a silent auction. The money raised benefits a specific chamber project or program. Sponsorship gives businesses an opportunity to market to fellow Chamber members through hole signage, entrance signage and program listing. This event is quickly becoming one of the most popular annual events. It showcases the specialties of our local retail shops and eateries in a festive evening event on The Commercial Street Mall, with live music to add atmosphere. The event not only draws visitors from around the region, but also gives Atchison County citizens a chance to rediscover local businesses and what they offer. A new event with lots of potential for the Atchison area, this fishing tournament brings catfish anglers and their families to our beautiful Riverfront area. The weigh-in event also draws a host of spectators to view the Missouri River’s biggest fish. The Chamber provides prize money for the winner and aids with promotion of the event. This event has the potential for sizable growth. This new event brings the holidays alive and highlights Atchison’s beauty. Numerous activities are planned for an action-packed day in early December, including a lighted Christmas parade, children’s puppet shows, children’s train rides and Santa’s workshop. The event brings visitors and locals in proximity to Atchison retailers, enhances our quality of life, and fosters a spirit of giving and community. 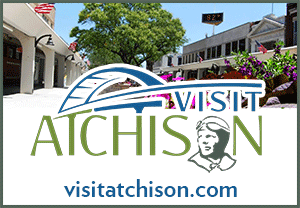 Thank you for your cooperation with your Chamber and for your work in making Atchison a better place to live, work, raise a family, and visit.